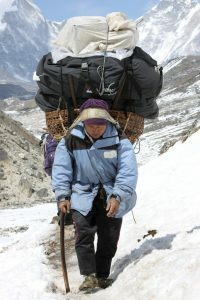 How much does a guide ,Porter-Guide and Porters cost in Nepal? The amount you pay for your guide in Nepal, or porter or porter-guide can vary quite a lot. Some guides in Nepal will cost a lot of money and for other Nepal guides you’ll pay very little. What varies the most however and what you may never know, is how much of that money actually goes to your guide or porter and how much the trekking agency in Nepal or elsewhere keeps for themselves. Nepal Guide Info Team was formed with guides in Nepal and is ran by guides in Nepal, which means we really care about the quality of life of our guides and porters and are committed to ensuring every single trekking guide that works with us gets paid properly and is well looked after. Before you look for your team, make sure you know the difference between a guide and a porter. The talkative ones with the jokes and the knowledge to share to really enrich your experience. Porters The heavy lifters, who’ll always have your warm clothes waiting for you at the other end. The Jack-Of-All-Trades. They know where they’re going and they can help you get there if you need it.